I came up with this recipe a few months back, determined to phase out the bold Christmas treats and get a bit more protein in. 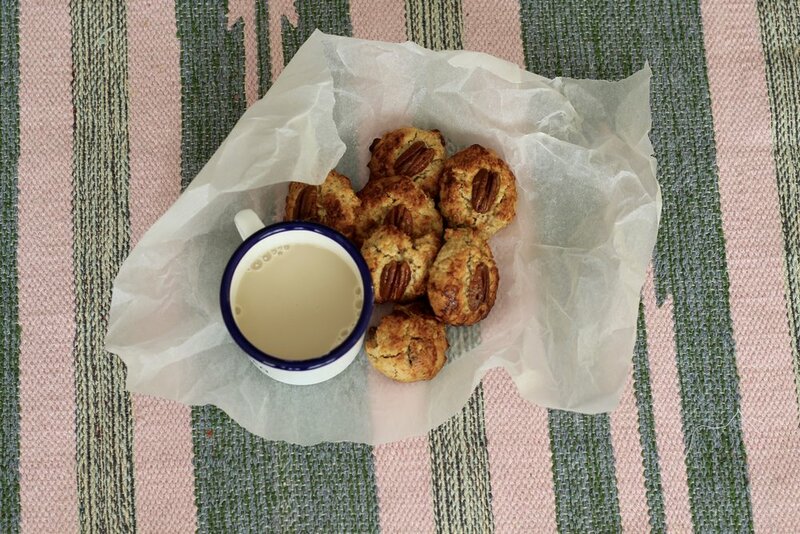 They are of course a treat, but with less than a teaspoon of sugar per cookie, they're a perfect pick-me-up instead of that muffin when it comes to our 11am coffee break. There's been a great reaction to then amongst the friends (someone tried to buy the last one off me that I was determined to keep for my boyfriend), so I thought it was hight time to share the recipe around! Feel free to mix it up a little, try a different nut instead of pecans or swap honey for maple syrup for a subtler flavour. 1. Set the oven to 180˚C, for fan assisted ovens about 170˚C, even a little lower. Line a baking tray with baking paper. 2. Add the oats, corn flour, rice protein, ground almonds and baking powder to a large mixing bowl and stir. 3. Melt your butter (or coconut oil) in the microwave - I do 20 seconds at a time so it's just melted but not cooking. 4. In a small bowl whisk up the egg. 5. Add the butter (or oil), maple syrup and half the egg mix to the dry mix and stir to make cookie dough. 6. Stir the chopped pecans into the cookie dough. Shape the cooking using your hands or a spoon and pop them on the tray. If you like, press a whole pecan into the top of each cookie. 7. Brush the remaining egg mix onto each cookie - this gives them a lovely colour and also stops the pecans from burning. 8. These little guys stay good for quite a few days in an airtight container, but trust me, they won't be there that long!